Editor’s note: this post was updated to correct an error regarding one of the menu items. County Eats is not a one-man operation. If you’ve been a long-time reader, you know that my wife Julie – and lately, our son Jakob – has been along for nearly every blog (she even wrote a couple herself recently). Most times, our experiences are the same. If one of us is happy, the other is happy. If one of us has a good time, the other has a good time. Sometimes, though, things go a little differently. That’s what happened on a recent trip to Ganly’s Pub & Deli. 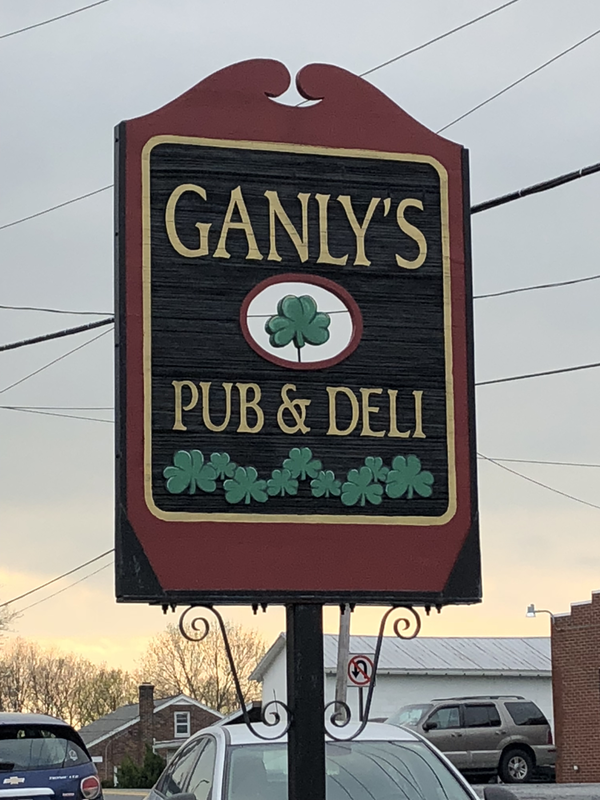 Ganly’s sits at the end of State Hill Road, where it meets Brownsville Road and Reber’s Bridge Road in Lower Heidelberg Township. It’s a beautiful building in a location that’s out of the way for many. The restaurant had fallen off of my radar for a while, but this year’s Wilson Iron Chef brought it back to the forefront. Not only did Ganly’s impress in the People’s Choice competition with its apple, brie and bacon crisps, Chef Ben Hinkel put in a great effort in the Iron Chef competition, itself. A few weeks later, we paid the restaurant a visit. 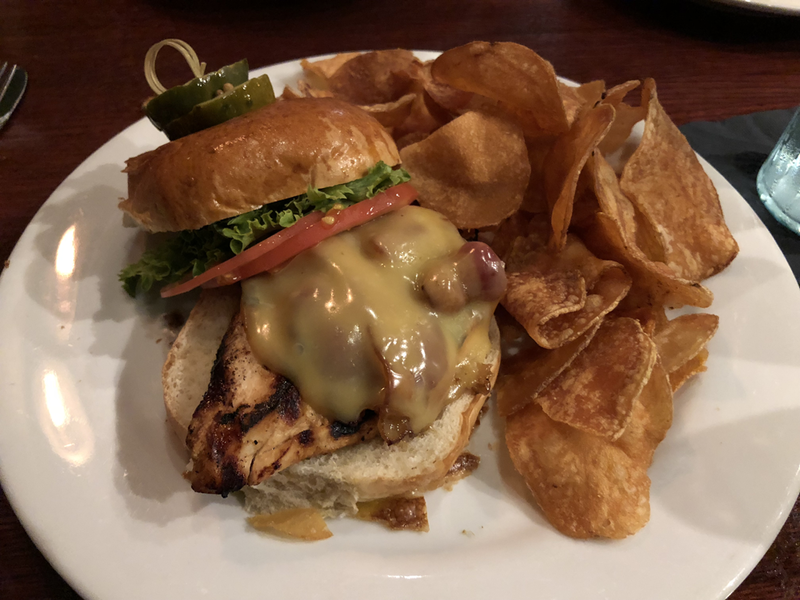 It wasn’t our first time dining there, but it was our first time in years and the first time for the blog. 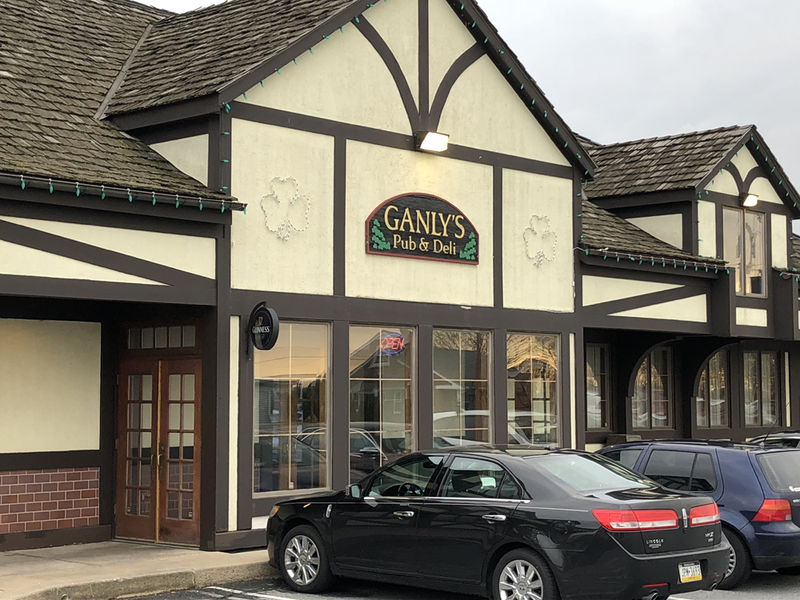 Ganly’s doesn’t offer reserved seating on the weekends, but Julie was able to call ahead and add our name to the wait list – a 30-minute wait on this Friday evening. We arrived early, hoping they were overestimating, and were told it would still be 20-30 minutes. 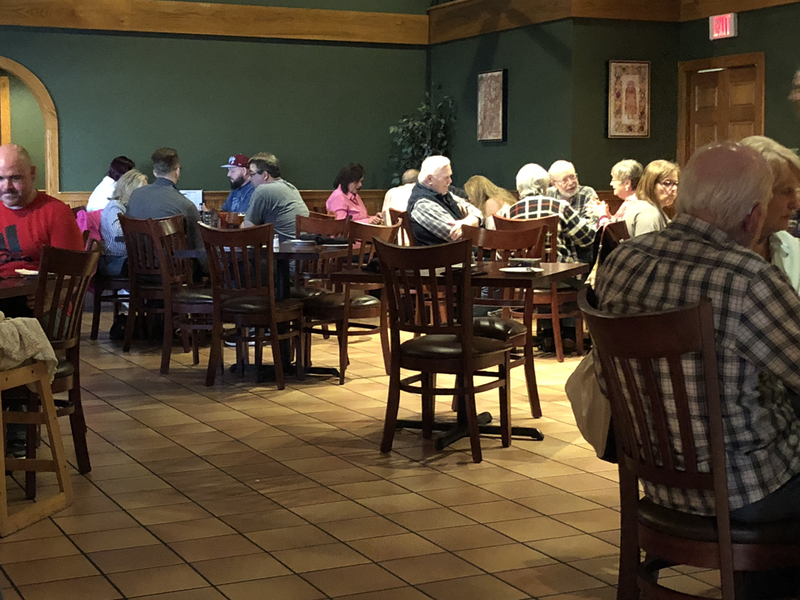 It ended up being a full half hour until we were seated in the main dining room – additional seating can be found in the bar area on the opposite side of the building. Jakob had napped through most of our wait so he was wide awake by the time we sat down for dinner. So even though we had his car seat in a high chair, Julie and I took turns holding him through the duration of our meal. Both Julie and I started with a cup of soup. For Julie, it was French onion. For me, it was fire roasted tomato – the daily special. 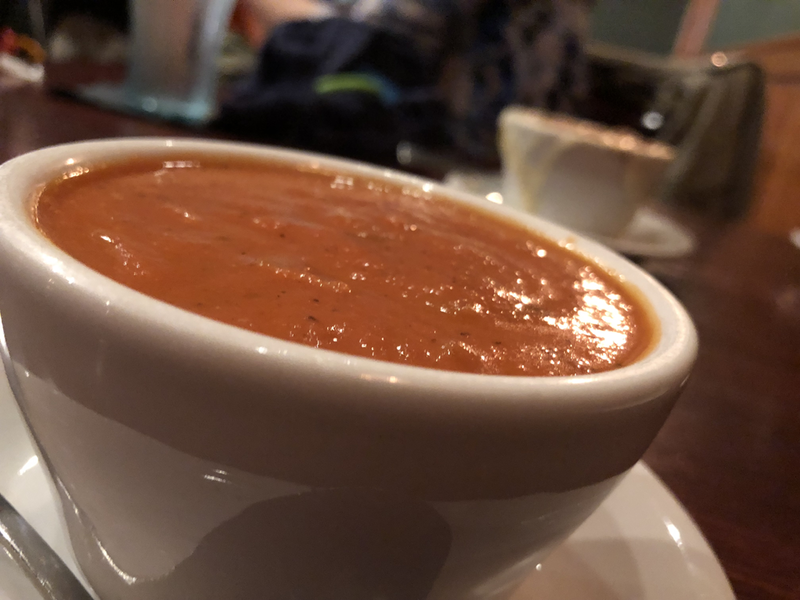 The tomato soup was different from any other that I have tried. It was a chunky soup – not with tomato chunks, but with carrots, onions and other vegetables. It was well-seasoned and enjoyable, a good start to the meal. 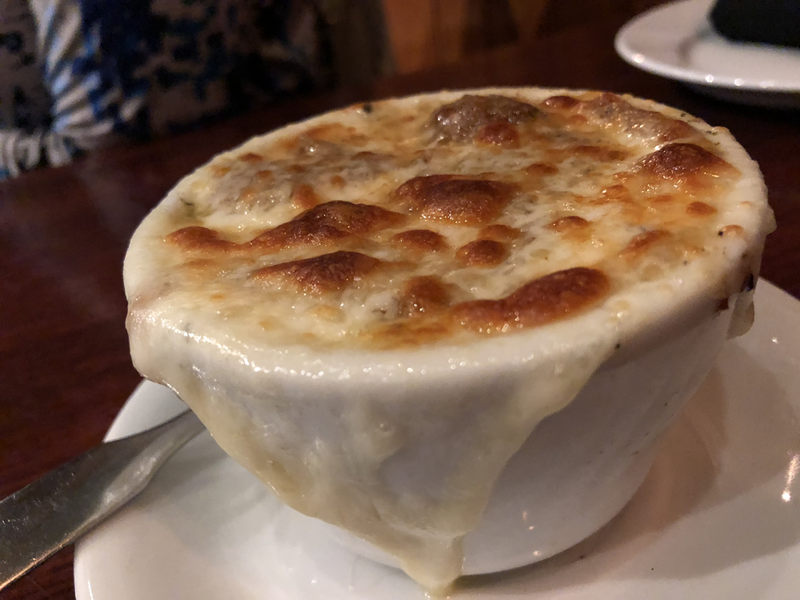 Julie’s French onion soup was good, but nothing out of the ordinary. A solid start, but it was after this that her meal went sideways. The appetizer special of the day was a smoked salmon BLT. When asked, our waitress told Julie that it would be enough for a meal. And it was. 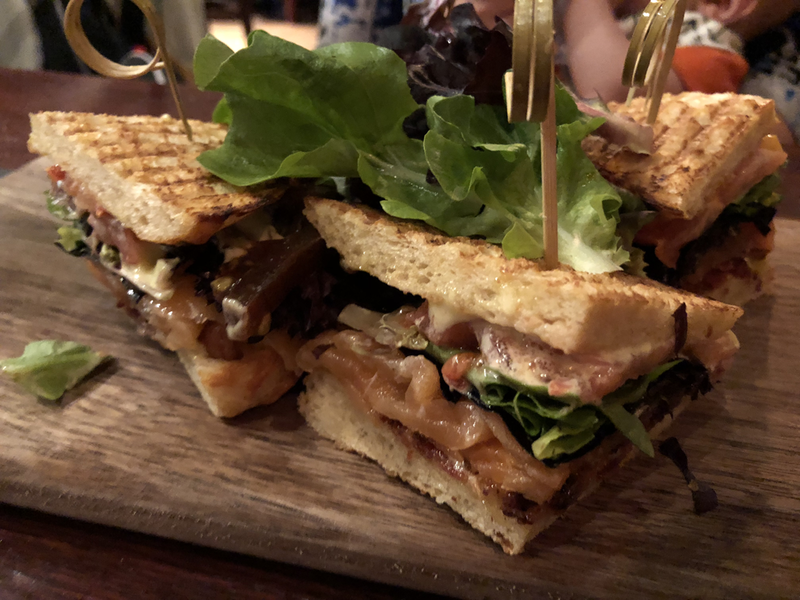 The BLT looked beautiful when it arrived, a focaccia roll loaded with smoked bacon, heirloom tomatoes, housemade mayo and smoked salmon. After her first bite, Julie realized that while she loves grilled salmon, smoked salmon is not her thing. She tried some more but she just did not care for it. It wasn’t Ganly’s fault, but and we were more than happy to pay for the dish, but Julie knew she wasn’t going to eat it and placed an order for another dish. So while she waited for her next meal, I worked on my bangers and mash. Americans would call it sausages and mashed potatoes. 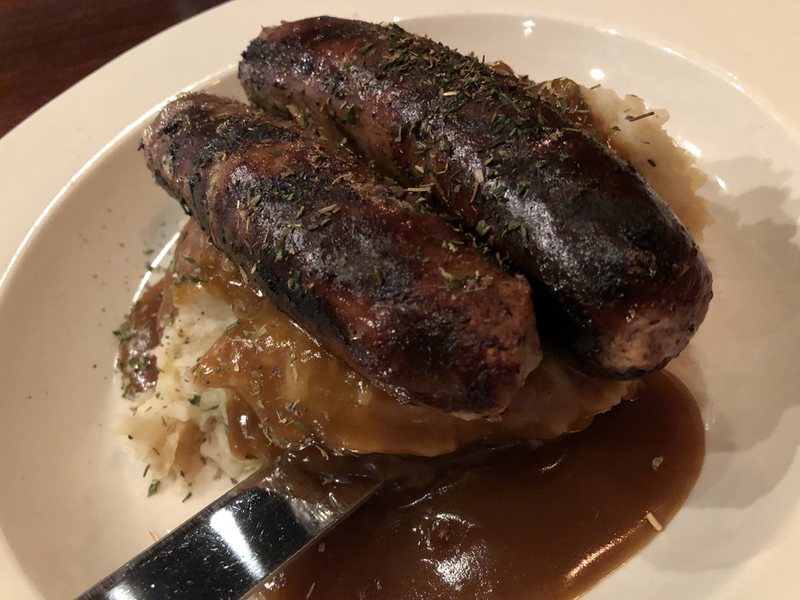 The bangers had a crispy outside and a great flavor that was spiced more like a German wurst than an American-style country sausage. The mash was actually colcannon. Colcannon is mashed potatoes with the addition of cabbage. It was a subtle difference, but it was very good, especially with the gravy. I really enjoyed everything, but could only finish half of it, partially because my meal also came with a salad that arrived just moments before the bangers and mash. The salad was your basic mixed greens and choice of dressing. It wasn’t anything special, but it was a hefty salad. 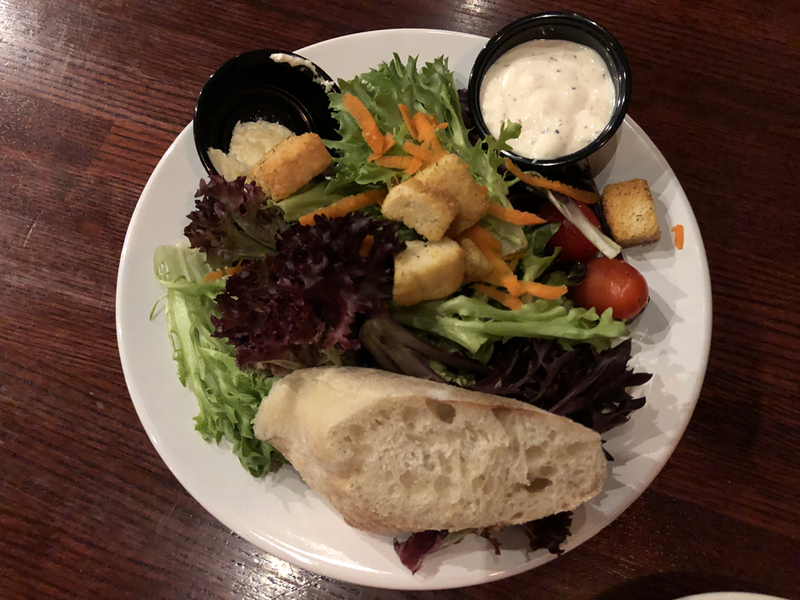 Had I known that my entree came with a salad, I may have skipped the soup, but I had already ordered the tomato soup when the waitress asked me what dressing I would like. Julie handed Jakob off to me once her replacement meal arrived. It was the chicken and smoked gouda sandwich. The gouda was a nice change of pace, and the roll was very good. The house chips on the side was okay, but could have used a little more salt and other seasonings. By this point, we had been at the restaurant for nearly an hour-and-a-half and all Julie cared about was the eating, not the reviewing, so she hurriedly ate her sandwich. We received our bill and the BLT had been removed. It wasn’t necessary as they restaurant had done nothing wrong. In total, our bill was a little over $40. It was a mixed bag for us. For me, it was a great meal. Though the wait was a little frustrating. For Julie, it was a bit disappointing as she really wanted the smoked salmon BLT, but it just wasn’t what she thought it was going to be. And her wait was even longer. If she hadn’t had that soup, I don’t know if she could have lasted until her sandwich arrived. But I have to give credit to our waitress who handled it well, despite having to work too many tables (she was also serving in the other dining area) and not being at fault at all. Hopefully next time is a better experience, one that we can both enjoy.